"Our organization’s number one goal between now and November 2012 is defeating Barack Obama. We look forward to the Iowa Straw Poll as the kickoff to this effort. Barack Obama’s tenure in the White House has been an unmitigated disaster for all Americans, including gay and lesbian Americans. Defeating Barack Obama and putting a conservative in the White House should be the number one goal of every single person in the conservative movement." 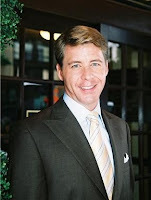 - GOProud president Jimmy LaSalvia, who hilariously adds that "this Republican presidential field is shaping up to be an incredibly strong one."